The old adage, "They sure don't make them like they used too." is more common than we would hope. However, Crypton Home is made for active families with children and pets or even those who frequently entertain. We decided to check out Crypton's claim regarding ease of cleaning stains for ourselves. These photos show our results. Note: Results may vary. We poured Worcestershire sauce and Red wine on the fabric. Then to make it worse, we rubbed it in and left it for 4 hours. The last photo shows the fabric after using a mild solution of Dawn Dishwashing liquid and water to clean it up. One of the best upholstery fabric supply companies in the U.S. gives us a shout out for the quailty we work so hard to achieve. Here is a quote that we should consider. Quality is never an accident; It is always the result of high intention, sincere effort, intelligent direction and skillful execution: It represents the wise choice of many alternatives. One of the most fulfilling aspects of working with decorative home fabrics is witnessing the beautiful end results of projects completed by our talented interior designers, sewists and upholsterers. I am continuously amazed at the artistry and craftsmanship that is shared with us daily, whether it be gorgeous draperies, an impressive slipcover or set of antique wingback chairs. When fabric arrives at Greenhouse, it’s rolled face-in on a 50 yard bolt or shown in a small sample. So, seeing our fabrics made up is very exciting. I love sharing our customer work with you on our Facebook and Instagram and having guest bloggers give advice and inspiration on our Greenhouse Blog. Recently, I came across the work of our customer, Kurt Westerfield, owner of Furniture 4 Generations, in Vancouver, WA. His upholstery skills are impeccable. Similar to Greenhouse Fabrics, his family has been in the upholstery business for four generations! Kurt says he learned the craft in his father’s shop. “To this day I use the best practices when upholstering a piece of furniture and sometimes that means utilizing the old ways handed down to me,” like hand tying springs and horsehair padding. Take a look at this beautiful curved front antique sofa with 8 way hand-tied seat and back springs that Kurt rebuilt for one of his customers. Click on the link below the image to watch Kurt's video. Click here to see Kurt's upholstery skills. One of my favorite pieces that Kurt has reupholstered in Greenhouse Fabrics is this stunning mid-century sectional with built in corner table. It is nothing short of impressive. Kurt’s knowledge and experience with furniture and fabric allowed him to guide his customer “in the right direction to complement the style and era without controlling…personal choices and detailing touches.” The craftsmanship and skill he has displayed on this sectional is ever apparent. Kurt is getting ready to launch his own mid-century modern inspired collection, Retroland Furniture. His pieces recreate the futuristic design of mid 1950’s furniture, featuring clean lines and minimal ornamentation. I’ll be on the look-out for that. Below is one of Kurt's sofa designs from Series 1955. Please keep sharing photos of your work! It is wonderful inspiration for us and for your peers and prospective customers. It makes it so much easier to visualize what a particular fabric weave or pattern is going to look like when we can see a finished project. To get inspired by your peers, follow Greenhouse Fabrics on Facebookand Instagram. Tag us in your images, and use #greenhousefabrics to share your work. We had a Mid-Century sectional reupholstered by Kurt, the owner of Furniture 4 Generations. Originally we were considering selling this piece but thought we would make that decision after we talked it over with Kurt. Once we spent time discussing what we would have when the project was completed there was no question remaining except one, "when can we start"? Kurt has 4 Generations of skill that is apparent in his finished product, a workmanship that is hard to find these days. Kurt gracefully steered us in the direction to complement the style and era without controlling our personal choices in fabric and detailing touches. With that, Kurt adding his experience and vast knowledge, built on the foundation we laid out... we now are the proud owners of this piece of history. I don't know the exact word to describe the finished piece, I think two words... "Stunning" and "Impressive" describe it. But the pictures say it all! Thanks Kurt! You exceeded our expectations, you truly under promised and over delivered! Kathy and Gary were a fun and creative couple to work with. I would have hated to see them sell this mid century sectional. In fact I may have purchased it myself if that had been their decision. Look how nice it looks in their home! Sectional in it's original state. Note that fabric is in good condition, but does not fit the mid century design of the sectional. I really liked the built in corner coffee table on this piece. Stripped down to it's bare bones, which were in solid. Sectional back in it's home with new look. Now it looks like it would have in the 50's. The rounded end is a typical design element of the mid century sectionals. This side angle view allows you to see the flow of the curves. Kurt thank you!! I came to you with a very challenging project and you worked tirelessly to make sure I got what was going to make me happy, no settling for good enough! 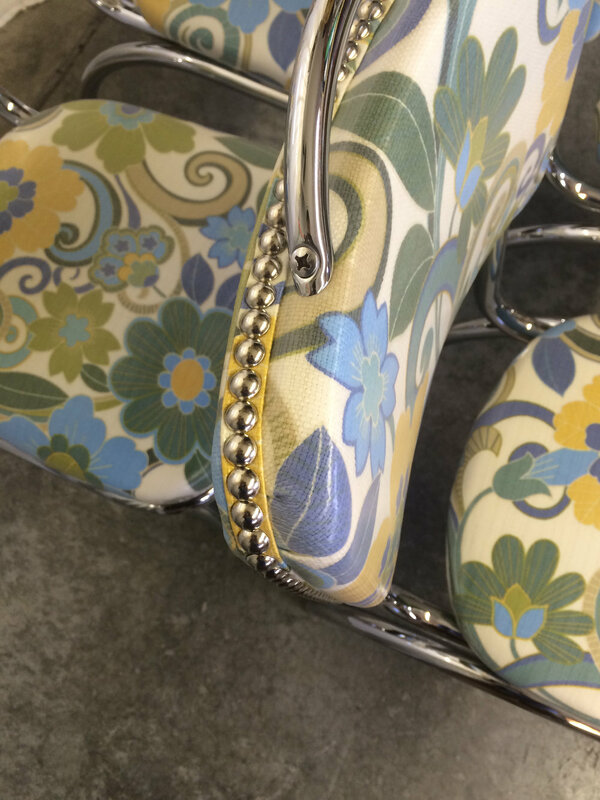 You spent hours researching and all the extra time and energy you put into the reupholstery of my vintage dinette chairs will forever be appreciated!! Thank you thank you thank you!!! I really enjoyed this project and the opportunity to research alternative options to allow Lene to get the look she wanted. Laminated fabrics typically come with limited print choices and those tend to be child like. By finding a multipurpose fabric in a design Lene liked and sending it to a company to add a clear laminate made both of us happy. My wife was ready to steal these chairs! Phone: 360-852-1717 - Please Call for An Appointment At Workroom.